Tomorrow is the Super Bowl. Football season starts in August when it is hot and balmy, real sangria weather. Now, in February, sangria is the last thing on our minds. But should sangria be remote just because it is snowing? How about a very winter sangria, a Fireside Sangria. Something to sip and relish as you watch the Big Game. 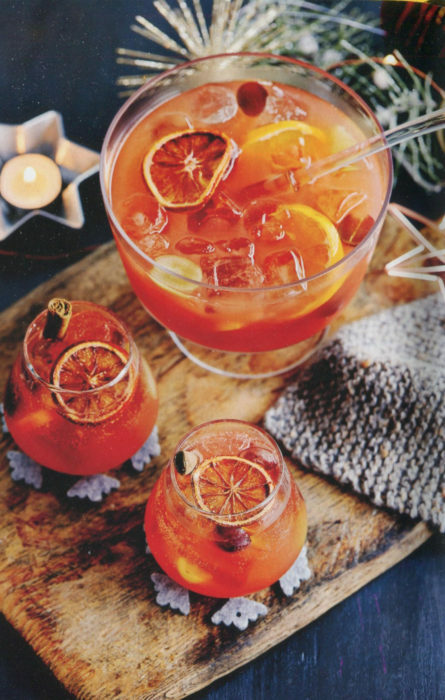 This is a sophisticated punch made with Grand Marnier, vermouth, clementine juice, Sauvignon Blanc and sparkling rose. A few sips of this and you won’t mind any fumbles or interceptions! If you look at the other blog posts this week, you’ll see food ideas for your game enjoyment. And I’ll have one more beverage idea first thing Sunday morning, just in time to make a run to the store and mix up another punch you’ll love: a Cranberry and Orange Sparkler. This recipe comes from Rosé Cocktails, a truly sparkling book. Put the grapes and orange slices in a punch bowl. Pour in all of the other ingredients, including plenty of ice cubes and stir. Serve ladled into ice-filled tumblers or red wine glasses and garnish each one with a dried orange slice and a cinnamon stick.